La Casa Madera - Bioclimatic House on top of the world with Pacific Ocean Views! This newly constructed Bioclimatic house sits on 3 meter deep metal columns to allow for air flow around the home, fresh air throughout, and to relieve our mountain of erosion typically associated with new building. Our property is recognized for its environmentally friendly practices, and this new home is no exception. Still a work in progress, expect to see us and the gardener wandering around as we add paths, gardens, and waterfall collections around our new 1.25 acres masterpiece! 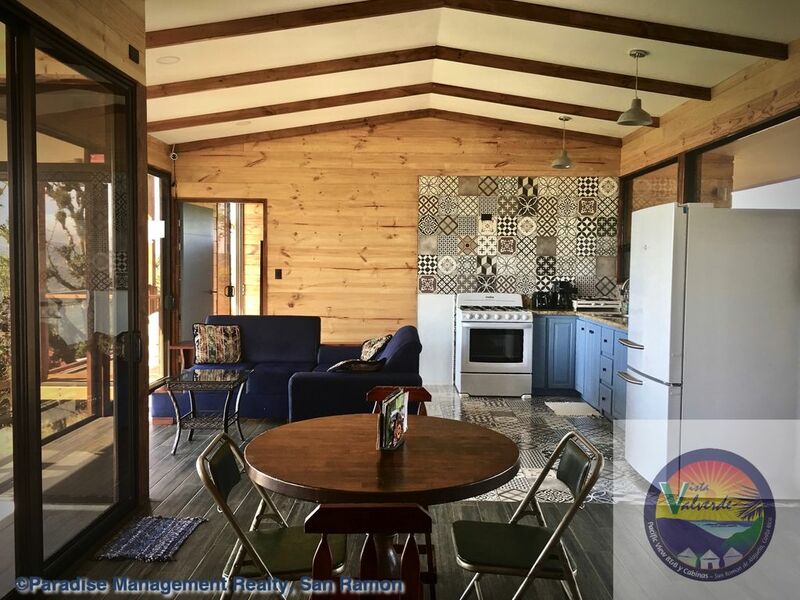 Located in just the right spot with views to San Ramon central to the East, and the Nicoya Peninsula in the Pacific Ocean to the West, we added a full covered front porch where you come into the home, as well as a covered terrace off the living area and another off the master bedroom. With walls if windows throughout the home, enjoy magically changing views to nature from inside or out! The home sits at 4000 feet above sea level which invites clouds and sunshine, sunsets and sunrises, birds and butterflies of all kinds right in front of you! We are a small mountaintop of just 6 homes so feel completely private knowing folks are right ehre if you need them! Great for short or long stays, especially for folks thinking of moving down to Costa Rica. Our real estate office is just around the bend! Mountain spring water, gorgeous views, easy access to town in less than 8 minutes, great amenities all throughout San Ramon, this is a perfect central spot for visiting so many different areas in Costa Rica, or to just sit around and do nothing. Pura vida!